In the first golden age of country music, from the mid-1920s until the early ’30s, the Scottdale String Band held one of the leading names in OKeh Records’ catalog of Old Time Tunes. The band took its name from the cotton mill village of Scottdale, located between Decatur and Clarkston in DeKalb County, Georgia. String bands without fiddles, groups of mandolins, banjos, and guitars, in varying combinations, were quite well represented on records in those years. 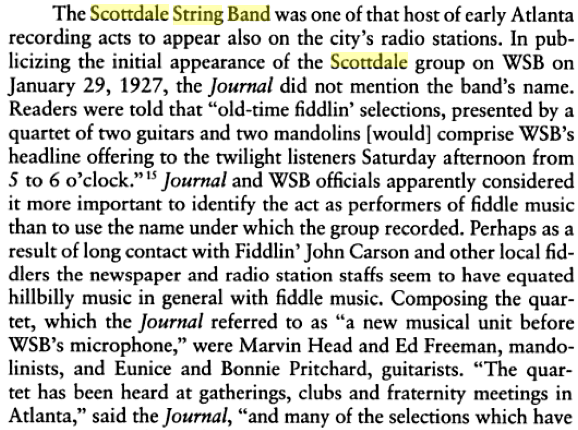 But the Scottdale String Band’s extensive and diverse legacy of sparkling performances ranging from ragtime tunes and popular songs to waltzes, breakdowns, and blues, sets them apart from their contemporaries.